Online news site Quartz made a ranking of salary value in programming languages, from highest to lowest based on job postings. Here are five programming languages you can learn to make yourself more competitive and earn more money. Ruby is a great language for web applications. Many major web services use it, such as Twitter and Hulu. And then there’s Ruby on Rails, which is the most used framework for Ruby. Many agree that it’s easier to learn than other languages like C++. The Quartz article ranks Ruby on Rails as the highest earning programming skill. For more information on Ruby, Michael Morin has created that covers the pros and cons of this scripting language. The programming language behind OSX and iOS apps, it’s easy to see why Objective C is an in-demand language. iPhone is about 36% of the US smartphone market as of 2015, which is down from previous years, but most businesses would be insane to not have an iPhone app in this market. If you’re interested in giving Objective C a try, there’s a great tutorial at Code School. Python (named after Monty Python in the 1980s) is, like Ruby, an intuitive language to learn and use. It has a rabid fan base and is the backbone of the popular Instagram social network. Python is a scripting language that has multiple examples of implementation in different industries, including the film industry -- Industrial Light and Magic uses Python to extend their software capabilities in-house. There’s a whole list at Python.org with further examples. If you’re interested in learning more about Python, check out this overview on the Treehouse Blog. 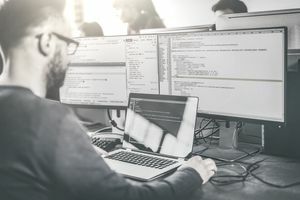 Java is one of the most popular programming languages in the world, and for good reason - it has very little operating requirements; meaning it can run on multiple platforms. Java is also part of the framework for building Android applications, so it’s a language that is in-demand even today. Oracle provides Java documentation to help get you started. C++ (originally known as “C with Classes”) is the oldest programming language on this list. It was first introduced in the early 1980s. It’s the backbone of every single piece of software that you use every day. According to a discussion in this Stack Overflow thread, C++ is used for performance-intensive tasks like video compression. Cplusplus.com has a tutorial that can help you get started. Knowing one of these five languages can help you earn a higher salary, but you don’t have to specialize in just one. If possible, familiarize yourself with a few of these languages. Then, if one falls out of style, you have another language proficiency to fall back on. As we’ve seen in the past, specializing can lead to you becoming obsolete in the field. In any field, you should always be learning new skills and technologies. And with all the free/affordable online options available, it is easier than ever to level up.